I’m always mixed writing about E-Sport team and organization websites. On the one hand, all companies should have a proper representing websites both for their sponsors as well as a hub for all relevant information. Even if rarely used, a website for an org. is just obligatory regardless of its financial status (self-funded/financed or completely volunteer). However, some websites can be overbearing in terms of information that it turns people off or has them rely on more orderly places to get their news about your organization. There’s an art to team and organization websites, especially when you have to take into consideration of the scene. For StarCraft II, Team Liquid and Reddit are often the commonplace to both reroute people to a team’s website as well as get the company promoted and noted in the minds of fans. Because of this, some areas become less important than others and often times clutter the front page. Dota 2 works similarly with JoinDota, PlayDota, /r/dota2 and TeamLiquid being the main faces of community discussion, news publication and exposure. These centers limit how much traffic one would get on their website, but they also help keep everyone informed and gathering to the same place. It’s a double-edge sword that constantly demands websites to be reworked overtime. Information is the fine line between a commending and appealing website to one that is overflowing with redundancy. While some websites keep it lean and clean, others tend to plaster their entire front page with everything they can think of. What lead me to writing this piece was the constant teasing about how poorly managed Major League Gaming’s website is and how easy and accommodating IGN’s Pro League website can be. As shown, MLG’s website highlights everything they are offering on their front page. Including Headlines, possible products, relevant news, their partners at the bottom, best videos of MLG (scroll down), Post season of 2012. Top bar includes: Video, Pro Circuit, GameBattles, SC2Battles, Community, Store, Support, Pro Circuit (again), VOD, Passes, Schedule, Players, Results, Photos, MvP. IPL’s website makes sure to plaster their stream in the middle, with an easy-to-maneuver initial bar for other broadcasts/games/history/live/on-demand. Schedule and Latest articles are filted according to the game and recent matches. Everything else is on another page and not redundantly placed. A clean and sleek website. Although both organizations have grown since then, it has always been surprising how their site always invoked the same feeling of “drowning-in-information”. 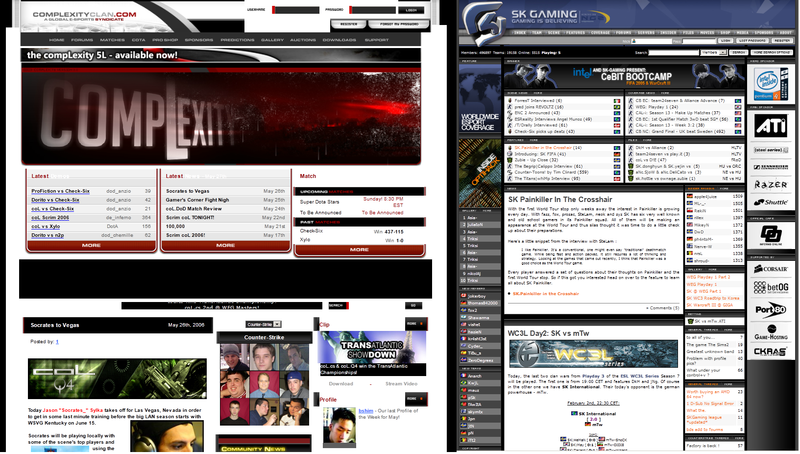 This framing remained for SK Gaming and Complexity since 2005-2006 (as the screenshot portrays). Websites like these suffer from the issue of trusting their visitors and netizens into a sea of excessive content. They put everything on there like a writer who spends too much time describing a setting just so you, the reader, gets the gist that it is a spring morning (I am guilty of this). My first rule when constructing your website is to trust your target audience. In the case of Complexity & SK Gaming, trust that they have or will check out your Twitter & Facebook and put what really matters on the front of your page. While the forums and general news are great and appealing, they take a backseat to what you really want to promote and what makes your organization stand-out. For IPL and MLG, it’s their in-person events and broadcasting competitions. For team organizations, it’s about the players, marketing and content that makes them stand out uniquely. This needs to be emphasized to show visitors what to look for and to better describe what the organization’s best-selling point is. Cutting the team website’s front page can be a difficult and lengthy process: which areas are redundant; not pulling their weight to draw in new visitors (and have them returning)? It’s a question of balance in terms of how much resource an org is willing to devote as well as return on that input. Cutting the fat to make your front page a splash of renewed interest and priority is like keeping your menu short and sweet. Consider yourself a restaurant that has some recognition in its steaks and team of chefs (Pro Gamers). Do you surround the achievements of your team and their reputable meals with other complementary side-dishes such as community and forums when the customer can get that at any family restaurant? Figuring out what shows the team’s best foot is a question of evaluation and understanding of your scene (as previously said) as well as what your market wants to know (or looks for). Recognize this website? 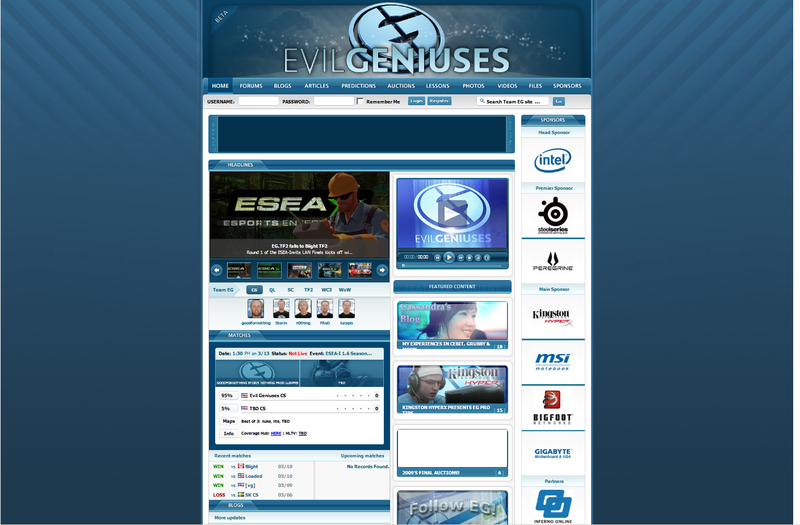 EG’s website of 2010 resembles a lot of what we see with SK Gaming today. Clutter. I see a very useful storage space for everything Team EG related, but I don’t see anything more important than another. If we look at EG’s website now, they keep things separated and clear-cut: Facebook, Twitter (and their players’ twitters) and Youtube to promote and push unique content that they can produce. News articles relating to their players and events are website-worthy. A concise description of their division teams and an isolated area for their sponsors really catches the eye on what matters and helps retain information better for the visitor. Team Liquid and Reddit are used to announce important events and happenings, funneling the community towards their website. Events and webshows (OneMoreGame.tv – though not necessarily “EG”, but closely associated by involvement) such as the EGMCSL, which has its own separate site (http://mcsl.evilgeniuses.net/), are all ways to divert and separate viewership to better evaluate what is worth continuing. A proper system of promotion, redirection and dedication to your outlets are important to maintain a functioning site and its social media outlets. People remember where to go so long as there is a reason to and it’s repetitively done. Consistency and proper categorization of content is the key here and this is where TeamLiquidPro.com’s sections work. TeamLiquid is firm on the separation of community and their team content. Everything related to the team is kept in one area with major news, roster changes or sponsorships are announced to the community (as per all relevant news in the scene). What TL does with their team is keen on interactivity with the community (replay releases, interviews & feeds of their posts on the popular community forums) and constantly kept up-to-date by one magical being: Alex Schieferdecker (user: tree.hugger). News and the archives are found on one tab, replays on another, VODs from various youtube channels of event organizations on another page. While you can find this on nearly any other website, the site is organized with unambiguous terms and labels. As basic as this appears, on other sites we see terms used to encompass all of an area, but only be used partially. On Complexity’s website, there is an area for Downloads and another area for Media, but there is also an area for galleries and streams. All of this should be titled under one specific name and page. SK Gaming also likes to add one too many tabs for similar things: News, Features and Blogs all on the top bar of the front page for reading material. Videos, Albums, Files for Media and downloadable material. Blogs, Groups, Community, Forums for Community related aspects and so on and so forth. You can see these on other sites like Fnatic who have a separate page for everything, but all of everything on their front page as well (not as bad as Col. or SK Gaming). Presentation is everything and despite how reputable teams are within our scene based on their history, achievements and roster, their website fails to emphasize their strongest traits. Sponsors and fans want to see what they know their team best, the goal is to know what it is, isolate it and spruce it up to a degree that retains its impression on first-time visitors and has returning fans feeling proud.